Stare deep into this abyss. What you are seeing right now is one of the deepest views into space possible. 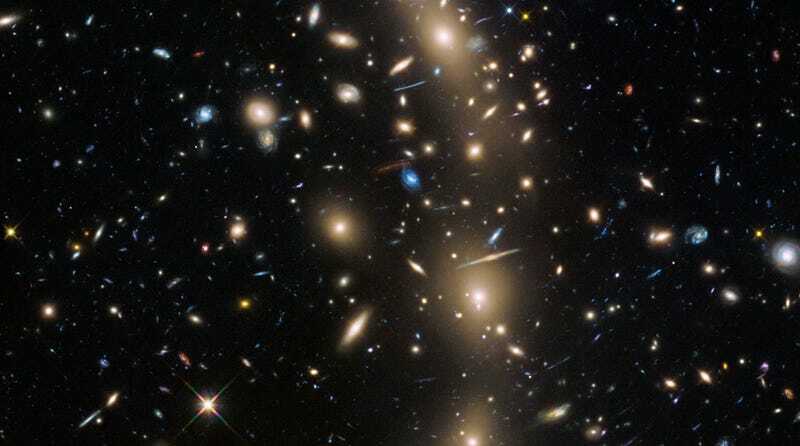 Hubble just snagged these shots of galaxy cluster Abell S1063 as the latest addition to its Frontier Fields collection, which shows us the very furthest views into space ever taken. Hubble’s deep images owe a lot to the power of the telescope, but they owe just as much to a weird naturally-occurring phenomenon called gravitational lensing. Gravitational lensing occurs when the combined gravities of galaxies in a cluster are pulling with so much combined force that they warp and ripple the space around them. The bent space also bends light, and this creates a natural “zoom lens” into space that lets us see much, much deeper than we ever could otherwise. The distortion doesn’t just let us see deep into space, though, it also adds a few other odd features into this particular view. For example, researchers have already identified at least sixteen galaxies in the back of the photo that are reflected multiple times by the lens, making it falsely look like they have a twin (or even triplet). These reflections, however, only make it possible for astronomers to calculate even more precisely just how space has bent to form this naturally-occurring lens.